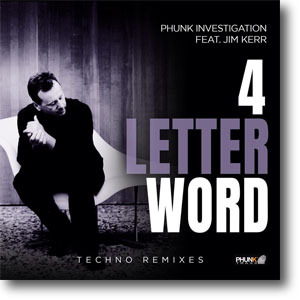 4 Letter Word was one of the tracks destined for The Return Of The Lostboy album, where it was known as Love Is A Four Letter Word. Jim mentioned the song back in in October 2010: "4 Letter World is the title of the new song I am currently working on. Music is by Armando "Dino" Maggiorana and we worked together previously on the Cry album. Dino co-wrote the title track, plus New Sunshine Morning - the latter is a particular favourite of mine. 4 Letter World is shaping up rather special, could be on to something great!" The song was shelved as Simple Minds became the focus of attention. It was not mentioned again for almost eight years. It was finally recorded by Phunk Investigation who released it under the name Phunk Investigation Featuring Jim Kerr. Phunk Investigation at the helm of the largest sound systems of the dance festivals, the conspirators behind famous tracks with George Michael, Simple Minds, Boy George, and many others are now at work on a new music step. A magic carpet ride in the Synth Pop World with a celebrated fellow traveler and inspirator: SIMPLE MINDS' JIM KERR. The first bullet fired is the track 4 LETTER WORD, a Synth infectious groove with contemporary lyrics... The releases including the Original Mix plus banger remixes by Engi, Vanity Crime and Diezel. All filled with dark throbbing techno beats, sharp synths and intense breakdown. WAS Born To Follow! Previews were uploaded to Soundcloud in November 2018. The House Remixes were the first to be uploaded which included the Original Radio Mix, Lino Di Meglio Dub Remix and the Lino Di Meglio Remix. These were quickly followed by the Techno Remixes which included the Engi Remix, Diezel Remix, Vanity Crime Remix and Vanity Crime Overseas Dub Remix. The single was released on 1st February 2019 through iTunes, Miniatures Records and Phunk Traxx, with a exclusive on Spotify the previous week (25th January 2019). It was split into two releases with Miniatures Records releasing the House Remixes, and Phunk Traxx releasing the harder Techno Remixes. The artwork was based on the Australian release of Don't You (Forget About Me) by White Spaces which was issued back in 2004.